Tashi view point, Ganesh Tok, Hanuman Tok, Flower show, Cottage Industry and Handicraft Centre, Institute of Tibetology, Dro-dul Chorten, Enchey Monastery & Banjakhri Falls (maximum 6 hours). Enroute visit Temi Tea Garden, Samdruptse & Siddheshwar Dham (Chardham). Morning: Darap village, Rimbi water Falls, Khecheopalri Lake & Khangchendzongha waterfalls. 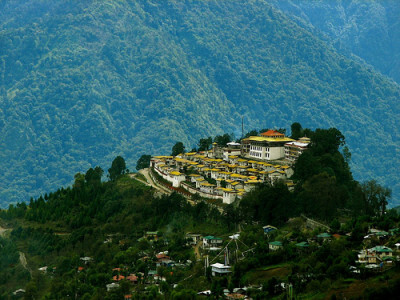 Early Morning (04:00 am): Tiger hill (8,400 ft.), Ghoom Monastery and Batasia Loop. After breakfast: Himalayan Mountaineering Institute, P. N. Zoological Park (Thursday closed), Tenzing Rock, Tibetan Refugee self-help Centre (Sunday closed), Tea Garden (Outer view), Ropeway and Japanese Temple. Afternoon: Mangal Dham, Deolo Hill, Dr. Graham’s Home, Golf Garden, Durpin Dara Hills & Flowers Nurseries. Meals (8 Breakfast + 8 Lunch + 8 Dinner) . Tour Guide from NJP to NJP.